CCC is a conference series bringing together researchers from real analysis, computability theory, and constructive mathematics. The overall aim is to apply logical methods in these disciplines to provide a sound foundation for obtaining exact and provably correct algorithms for computations with real numbers and related analytical data, which are of increasing importance in safety critical applications and scientific computation. Previous conferences have been held in Cologne CCC 2009, Trier CCC 2012, Gregynog/Swansea CCC 2013, and Ljubljana CCC2014. The conference series is linked to the EU-funded FP7-research project COMPUTAL (Computable analysis - theoretical and applied aspects) which constitutes a research network between Europe, Russia, South-Africa,and Japan. This conference is the forth COMPUTAL event, but is open to all researchers in the area. The conference specifically invites contributions in the areas of exact real number computation, effective topology, Scott's domain theory, Weihrauch's type two theory of effectivity, category-theoretic approaches to computation on infinite data, hierarchies of unsolvability, and related areas. Please find here programme and abstracts for the talks. There still might be minor changes. There will be printouts of the programme and abstracts available in Kochel. Abstract Submission: By 15 June 2015 via the CCC2015 Easy Chair Submission Page. Conference Dates: Monday, 14 September, morning - Friday 18 September 2015, early afternoon. The conference starts Monday morning, thus most participants will arrive on Sunday evening. There is the possibility to stay until Saturday as long as the center has rooms available. Tutorial talks are 45 mins, invited talks 50 mins incl discussion, contributed talks are 30 mins including discussion. 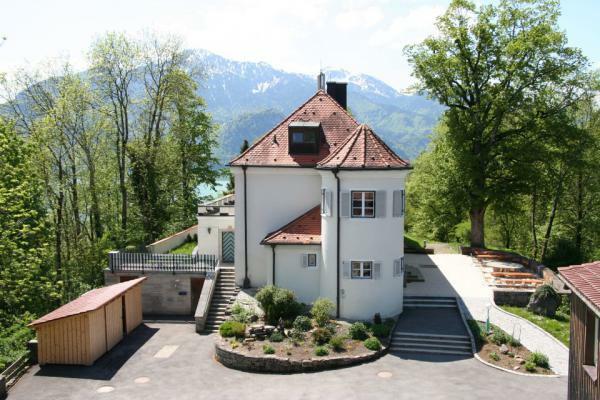 The conference will be held in Kochel am See at the border of the alps, in a small conference center Georg-von-Vollmar-Akademie - Schloss Aspenstein (Address: Am Aspensteinbichl 9, 82431 Kochel am See, Germany). See here for a virtual tour around the castle/conference center. The price per night, including meals and coffee breaks is 87.50 Euros, i.e. Monday to Friday (without conference dinner) will make: 356 Euros, to be paid in advance. The additional night from Sunday to Monday is 56 Euros, i.e. the standard price will be 412.00 Euros. [Note that there is no dinner on Sunday evening, but there are several restaurants in the village.] There will be in addition a small conference fee of 20/30 Euros. Registration - finalize by 13. July please- is done by an email to m.seisenberger@swansea.ac.uk. Please register asap by giving affiliation, arrival and departure date, as well as any dietary requirements. As the number of rooms at Schloss Aspenstein is limited, pre-registration is welcome. Reimbursement in case of cancellation: 50% until 13 August, 25% after that date. Social Dinner: Thursday evening in the restaurant Grauer Bär in Kochel. Planned is at the moment dinner a la carte. Note that on Saturday, 19 September 2015, the Octoberfest (Munich Bierfestival) starts! It might be interesting for the one or other to visit the Octoberfest, also note that because of the Otoberfest it might be difficult get accommodation in Munich and also Kochel for the weekend, therefore early planning is important. A return train ticket from Munich Airport to Kochel kosts 38 Euro (Sparpreis, valid after 9am) or 45 Euro (standard price) and can be booked via www.bahn.de (no registration needed). You can also buy a ticket at the airport (ticket machine, or office (the latter might be closed open in the evenings)). If you arrive in group, we recommend that you use the Bayernticket (28 Euro for two people, 33 for three people, valid one day long.) Note: You need to change at Munich Hauptbahnhof and presumably also in Tutzing. From Kochel station you can either walk (1km), see Schloss Aspenstein - Contact page for a google map, or call a taxi (Tel: 0049 8851 1315, please reserve in advance). Please see also Gäste-Info German or Guest-Info English.pdf for more information on travel and accommodation. The reception at Schloss Aspenstein is maned: Sunday 16-19 pm. Arrival outside this period is no problem. Further information via email. Facilities Projector and Paper flipchart in Konferenzroom. There are several discussion rooms for small group meetings. Ulrich Berger (Swansea), Monika Seisenberger (Swansea), Dieter Spreen (Siegen). Deutsche Forschungsgemeinschaft (DFG), European Commission, Japan Society for the Promotion of Science (JSPS).